We’re known for our thin crispy crust fat boy deluxe, and delicious Cinnamon Knots. Call now and ask about our specials (937) 592-3287. When you are looking for quality food with a fun, family-oriented atmosphere, look no further than Fat Boy’s Pizza & Ice Cream. For years, we here at Fat Boy’s Pizza & Ice Cream have been serving up family fun with quality ingredients at great prices. We have something for everyone in your family, and, best of all, you can always count on the quality ingredients at Fat Boy’s Pizza & Ice Cream to be fresh and taste great. Fat Boy’s Pizza & Ice Cream is the best place to bring your family to eat in Bellefontaine, OH. When you come into Fat Boy’s Pizza & Ice Cream, you will experience an environment in which you and your family can sit down, enjoy a great meal, and most importantly, spend quality time together. The Fat Boy's Pizza & Ice Cream experience begins with great tasting food. Pizza, ice cream, subs, wings, and more are all on the menu at Fat Boy's Pizza & Ice Cream, so you re sure to find something for every member of your family. Our friendly service continues the experience. 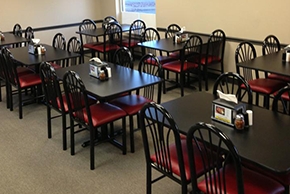 Our restaurant is always a clean and comfortable place for you and your family to dine in. Enjoy our big-screen HD television, free Wi-Fi, iHeart and Pandora radio. Our lunch buffet is from 11 a.m. to 1:30 p.m., on Fridays and 5 to 7:30pm on Wednesdays. Fat Boy’s Pizza & Ice Cream truly is the ideal place for you and your family to sit down and enjoy a delicious meal together. Our pizza recipe is time-tested and crafted to taste great, our subs are made from the freshest ingredients, and our ice cream is made locally at a dairy farm right here in Ohio so you know it will be fresh every time. Fat Boy’s Pizza & Ice Cream is the total package when it comes to quality family dining. From dinner to dessert, we make great food for the whole family. Come in and eat with us today!